Cancel Kavanaugh! Resist at the Supreme Court! Those of you who showed up in Teal, last Thursday, to support Dr. Blasey Ford made our hearts swell! 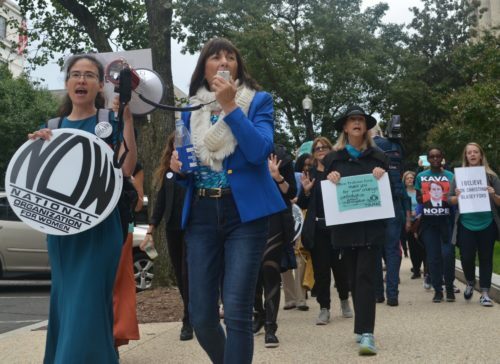 Help us #BelieveSurvivorsNOW, by marching again with the National Organization for Women, Women’s March, and others on Thursday, October 4th, in Washington DC. What Action Will We Take: We will march to the U.S. Supreme Court to show through our numbers and our rallying cries that Kavanaugh should never be seated as a justice in the U.S. Supreme Court. RSVP and Invite Others: Visit the Facebook event page. Questions? Contact NOW. Need local housing in the DC area? : Complete this form and someone will be in touch soon. Ongoing Actions: In addition to marching, we’re also protesting in the halls of the Senate. We need to meet with Republican senators face to face to urge them to stop the Kavanaugh confirmation. Sign up to join us on Capitol Hill this week. Shifts are available every single day this week, at 8:30 a.m., 12 p.m., and 4 p.m. Training begins in the Hart Senate Office Building Atrium each day at those times. Sign up for as many as you can, and someone from UltraViolet will get in touch ASAP. Sign up here.